If you are reading this then you are probably like me passionate about photography. It is not enough to take pictures and dream about the photograph we should have taken (if only ... I had my camera with me .... the car had stopped ... this person sitting across me on the train moved two centimetres to the left....I got out of bed this morning in time for the light.... tick all applicable excuses), we need to read about it, watch documentaries and we indiscriminately love any film featuring a photographer. 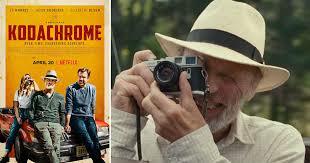 It is actually quite hard to love the main character in the film Kodachrome, released by Netflix earlier this year. Ben Ryder (brilliantly played by Ed Harris) is a renowned photojournalist who is dying of cancer and whose last request is for his son Matt to accompany him on a road trip from NYC to Kansas to the last remaining lab to process Kodachrome films. Ben Ryder has a few remaining rolls which must be processed before they are lost for ever. We run the gamut of emotions during the film while we witness the strained relationship between father and son. The film is very well acted but one of its main attractions is that it was beautifully shot on Kodak 35 mm. The film is based on true events: the last Kodachrome film was processed at Dwayne’s Photo in Kansas. The director of the film, Mark Raso, based his film on a 2010 New York Times article describing how the last roll of Kodachrome film was exposed and developed at Dwayne’s Photo. We photographers are a romantic lot who like to hark back to the past. A film to watch anytime, and maybe best on the train journey when you forgot to take your camera with you!